"'I SELDOM GO to church,' said Falconer; 'but when I do, I come here: and always feel that I am in the presence of one of the holy servants of God's great temple not made with hands. I heartily trust that man. He is what he seems to be.'" This description of the preacher in David Elginbrod is George MacDonald's tribute to his friend and mentor F. D. Maurice, arguably the most important Anglican theologian of the 19th century. MacDonald was present at Maurice's inaugural address at the Manchester Working Men's College, and one of his first jobs after leaving Arundel was as a lecturer there. Maurice read Phantastes in manuscript and helped MacDonald to find a publisher. In 1865, after their move to London, the MacDonalds started attending St. Peter's church in Vere Street, where Maurice was the rector, and as a result of his influence eventually became members of the Church of England. Maurice had not been brought up in the Anglican Church. In fact, he had been born and raised a Unitarian and for a time in adolescence had been strongly influenced by his mother's growing Calvinism. Perhaps partly because of the painful religious division within his own family, he longed for a truth that transcended human-made systems. He wrote later, "The desire for Unity has haunted me all my life through." The book for which he is most remembered, The Kingdom of Christ (1838), combines an extreme theological openness with an exalted view of the church. Nearly every denomination or Christian group has some of the truth, he argued, but no one should confuse his own theological perspective with the whole truth. Christians are united in Christ, not in certain ideas about Christ. For Maurice, the church is a "universal spiritual society." The two qualities are co-dependent. It can only be universal if it is spiritual (an inner reality as well as an outer organization). But it can only be spiritual if it is universal. Maurice believed that openness is at the heart of the New Testament. Everyone belongs to the church, without exclusion. The problem is, some people believe it and some people do not—yet. Salvation involves turning away from the sin of self-centered independence and acknowledging one's redemption in Christ, the King and Head of all humanity. "The Church is, therefore, human society in its normal state," he wrote; "the world, that same society irregular and abnormal. The world is the Church without God: the Church is the world restored to its relation with God, taken back by Him into the state for which He created it." Maurice did not approve of "gathered" churches—groups of people holding precisely the same beliefs. He supported the Church of England as "the Church in England"—a body of Christians of diverse beliefs bound only by the fact that they were neighbors and members of the same community. His model for the church is not a group who agree, but a family—whose members are bound by deeper ties than verbal formulas. The Patriarchs of Genesis were first and foremost relatives. The storyof Jacob, argued Maurice, showed that God's people were founded on family relationship and not choice. The Bible, instead of being a digest of doctrine to be picked apart by theologians, is God's letter explaining to the family of Christ their own position. Maurice was later one of the founders of the Christian Socialist Movement. This was not so much conventional socialism as it was an attempt to offer a Christian critique of social injustices. (Though its 19th-century influence was limited, Tony Blair, now Britain's longest-serving Prime Minister, has recently described himself as belonging to the "Christian Socialist tradition.") Maurice's political ideas sprang directly from his understanding of the church. His concern for poverty and its accompanying educational deprivation was not an extension of the old idea of "charity," but a principle of social theology. A universal spiritual society ultimately implied a redistribution of wealth. His work as the first principal of the London Working Men's College was fundamental to his Christian Socialism—an expression of his vision of man as a whole being. Social justice meant nothing without education. Maurice was widely respected for his Christian character, and his charismatic personality had a gravitational pull on many writers including MacDonald, Charles Kingsley, and John Ruskin. Controversy dogged his steps, however. Before his installment at St. Peter's, he had been expelled from his teaching position at King's College, London, for publishing a series of essays that challenged the traditional doctrine of eternal punishment. Whether this persecution was a direct consequence of his unorthodoxy (the official reason) or was actually part of a political witch-hunt (for his "dangerous" social views) is still debated, but so far from being the tragedy that many contemporaries thought, it probably gave his theological views wider circulation than they would otherwise have had—and new impetus to his ministry of unity and reconciliation. Alice in Wonderland and its sequel, Through the Looking Glass, are two of the strangest and most brilliant books ever written. Although they are best known as children's books, their topsy-turvy wisdom continues to speak to readers of all ages. Their author, Charles Lutwidge Dodgson, was born in 1832 to a respectable Anglican family of clergy and military officers. The third of 11 children, Dodgson was thoroughly miserable at public school and at Oxford did not study as hard as he might have done, but his obvious brilliance landed him a position as lecturer in mathematics in 1855, which he held until his death. He was ordained deacon in 1861, but did not follow his father's steps into the ministry. Rather, he spent his life as a mathematician at Oxford, and achieved modest distinction in his career. He is remembered today for his hobbies—photography and children's fantasy, which he wrote under the pseudonym Lewis Carroll. Carroll wrote Alice's Adventures in Wonderland in 1862, when he was 30 years old. He showed the book to his friends the MacDonalds, whose enthusiastic response persuaded him to revise and publish it in 1865. Carroll went on to write a sequel, Through the Looking Glass, in 1872; another great work of nonsense, the poem The Hunting of the Snark, in 1876; and the wordy and little-known fantasy Sylvie and Bruno (1889; part 2, 1893). Though a devout Christian, Carroll did not often express his religious views, and it is hard to tell the exact nature of his beliefs. The Alice books have been compared to MacDonald's works such as Phantastes, in which the hero enters a strange magical realm whose laws he must learn, encounters various creatures, and ultimately emerges from the experience wiser and more mature. reality upside down and show us a mad world that appears at first glance to be totally illogical. And yet the madness has a logic of its own, and the arbitrariness of Wonderland and Looking-Glass Land turns out not to be so alien to the world we live in. "Sentence first, verdict afterwards" ... "When I use a word... it means just what I choose it to mean." Centuries of injustice and reams of postmodern theory are contained in those two famous quotations. The world of Alice has become part of our imagination, because its craziness mirrors our own. Like George MacDonald, Charles Kingsley wanted to be a poet, became known as a novelist, is best known today as a writer of fantasy, and remained a preacher through it all. Kingsley initially entered the Anglican clergy in obedience to the wishes of his future wife Fanny Grenfell, and he was determined not to become the stereotypical "man of the cloth." He pursued a life of strenuous physical activity. Early rising, "hard work and cold water," and the simple doing of your duty were the way to holiness in Kingsley's view; taking your spiritual temperature was fatal. Along with his friend F. D. Maurice (whom he called "Master" after being deeply affected by The Kingdom of Christ), Kingsley was concerned with the plight of the working classes in Victorian England and was one of the founders of the Christian Socialist Movement. He saw true Christianity as threatened by Roman (and Anglo-) Catholicism on the one hand, and by Transcendentalism and secular ideologies on the other. He was also deeply interested in science, earning the respect of Charles Darwin. All of these interests found expression in Kingsley's novels, which, like MacDonald's, usually tell a story of painful spiritual growth. The young working-class poet in Alton Locke (1850), for example, learns through disappointment, imprisonment, and disease (of which he eventually dies) that political change is not enough without moral transformation. Kingsley's most famous work is his classic children's book The Water-Babies (1862), in which the poor chimney-sweep Tom drowns in a brook in the first chapter and promptly turns into an aquatic creature, learning wisdom and compassion (even for his cruel former master) after many underwater adventures. An allegorical mixture of fantasy, science, and satire, The Water-Babies is the closest the scientific and practical Kingsley ever got to MacDonald's mysticism. 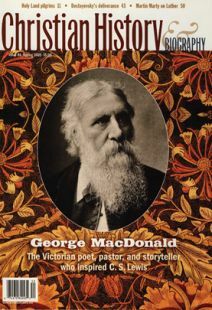 George MacDonald regarded A. J. Scott as the greatest man he had ever known. A Christian teacher in the Celtic tradition, Scott's influence on MacDonald was personal and literary and above all theological. seen." Moreover, the deeper we move in relation to any human being, the closer we come to the mystery of God. It is these two characteristics of Scott's theology that most significantly shaped George MacDonald's vision of reality. MacDonald met Scott in 1849 while studying at Highbury Theological College in London. By this stage, Scott was an independent teacher and preacher. In 1831 he had been deposed from the Church of Scotland for his critique of Westminster Confessionalism. For the rest of his life he lived in exile from Scotland. In England he transposed his theological convictions into political, cultural and literary activities. In 1848, along with F. D. Maurice and Charles Kingsley, he became one of the founders of Christian Socialism and helped establish cooperatives and centers of education for working men and women. Also in 1848 he was appointed professor of English literature at University College, London, where he became a close friend of John Ruskin. Then in 1851 he became the first Principal of Owens College, later Manchester University. It was in the mid-1850s in Manchester that MacDonald joined Scott for a number of years, even seeking refuge in Scott's home during a period of serious illness. "He understood me," said MacDonald, "and gave me to understand him." Of the secular "prophets" of the Victorian era, one of the most tragic and intriguing was John Ruskin. Born in 1819 to devout Evangelical Anglican parents, Ruskin launched himself precociously into fame in 1843, when he began writing a vast multivolume work of art criticism (Modern Painters). The final volume was published in 1860, by which time Ruskin had broadened his interests. He had come to believe that art reflected the moral condition of the people and society that produced it. Ruskin inspired a younger generation of artists and craftsmen (the Pre-Raphaelites), who combined an interest in medieval art with a commitment to social reform. He also taught art in Maurice's college for working- class men and eventually founded a utopian society called the "Guild of St. George." Though Ruskin longed to renew society, he struggled to control his own life. Ten years after the annulment of his marriage to Euphemia Gray (for whom he had written his classic fairy tale The King of the Golden River), he fell in love with a young, devout Irish evangelical named Rose La Touche. Rose's parents, however, were opposed to the relationship, both because of Ruskin's age and even more so because Ruskin had abandoned the evangelical faith of his childhood and by the 1860s was proclaiming himself a "pagan." For ten agonizing years, the MacDonalds (whom Rose's mother had introduced to Ruskin in the hope that they would bring him back to the faith) served as confidants for both parties, and at one point helped arrange a meeting. Rose's death in 1875 sent Ruskin into a downward spiral of mental illness, but it also ironically led to his regaining some kind of faith, though the nature of that faith is hard to determine. He described the core of Christian belief accurately and sympathetically in his autobiography Praeterita, and he was deeply fascinated by MacDonald's understanding of God, but he seems to have regarded Christianity as no more divine than any other religion. In his moral earnestness and his call for a society based on beauty and creative work rather than greed and mass production, he spoke with the voice of a prophet. Yet this prophetic stance came from a tortured soul. Ruskin longed to believe, but never found a form of Christianity that he could believe in. Octavia Hill was a social reformer and environmental campaigner whose legacy still touches our lives today. She was born into a family of reformers in Cambridgeshire, England. Her father's work in prison and educational reform and her grandfather's expertise on fever and sanitation influenced her interests, while her mother worked for the Ladies Guild, a cooperative association promoted by the Christian Socialist Movement. This guild worked among the London poor, and it was through her mother that the 14-year-old Octavia began her work teaching children from the Ragged Schools to make toys. In 1853, a significant year for Octavia, she met John Ruskin while studying art and joined F. D. Maurice's congregation. It was while working as secretary to women's classes at the Working Men's College founded by Maurice that she met George MacDonald, who gave lectures on literature to the women. Octavia soon began to direct her energies towards housing for the urban poor. Her schemes for improvement, backed by Ruskin's money, proved so successful that the work of remodeling and managing slum properties expanded from central to south London. Her friendship with the MacDonald family developed quickly. They staged dramatic entertainments for her tenants, and she spent holidays with them. Octavia Hill was with George and Louisa MacDonald to celebrate their golden wedding anniversary and among the close friends present when George MacDonald died. Despite the demands of work on housing projects, Octavia supported other causes, notably the Commons Preservation Society from which the National Trust was founded in 1895. This organization currently has a membership of about three million and is still actively engaged in the conservation of places of historic interest or natural beauty.